CLOVIS, CA -- The Buchanan High School track at Veterans Memorial Stadium will look a lot different when the State Meet rolls in on May 24th and 25th. 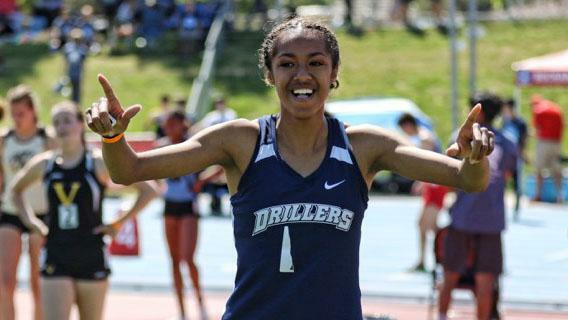 The 92nd running of the West Coast Relays marked the last meet on the Mondo surface that has been the track of choice for the California State Championships for the last decade. During the month of April, a brand new Beynon BSS 2000 Hobart surface will be put down with hopes of bringing new life to tired legs at the end of the season and provide even more of the fireworks we are all used to seeing at the California State Track and Field Championships! While the track surface may be different in May, many of the competitors who ran on it at the West Coast Relays on Saturday will be the same. The meet offered a mid-season glimpse at a couple of established state leaders as well as two new state leaders and a handful of other top-five marks. In one of the most competitive races of the day, Bakersfield High's Kynnedi McCall (54.61) held off the challenge of Clovis North's Takiya Cenci (55.25) and Tiara Adeniji (56.41) in the girls invitational 400 for a new state leading time. Central (Fresno) junior Simone Johnson took over the state lead in the triple jump with her winning mark of 40-6.50 which beat out Buchanan senior Haley Abirached (38-11.50) who set a new school record with her best jump. 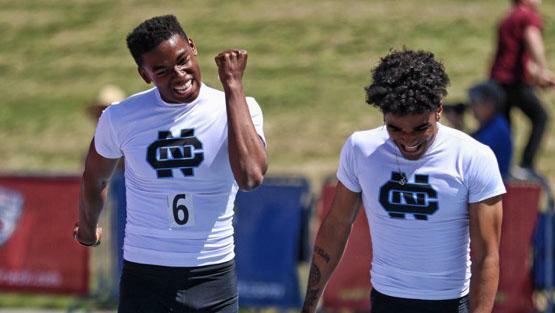 The Clovis North boys, who should be competing for a state team title, flexed their muscle with wins in the 4x100 relay (41.51) and the 100m with a 1-2 finish by Naythn Scruggs (10.74) and Caleb Foster (10.76). Foster also won the 110 hurdles in a new State No. 2 time of 14.13 and the long jump with a mark of 23-2. Also strong for Clovis North was the distance crew led by Isaiah Galindo's win in the 1600m in 4:18.71 and second place finish in the 800. In the closest sprint race of the day, Clovis North's Tyler Ximines lost to Paso Robles's Jordan Summers in the 400m by only one hundredth of a second (48.96-48.97). The 800m races provided some of the best races of the day with the boys' race being won by Dublin's Chris Middleton-Pearson (1:55.26) who had a spirited battle over the last 300 meters with large pack that saw five runners under 1:57 and 14 under 2:00 in the same race! In the girls' two-lapper, Edison (Fresno) sophomore Kennedy Jennings took off with 250 meters to go with only Buchanan distance ace Meagen Lowe able to stay close. Jennings (2:11.69) was able to hold off a late charge by Lowe (2:12.59) in the State's No. 3 and No. 4 times of the year. 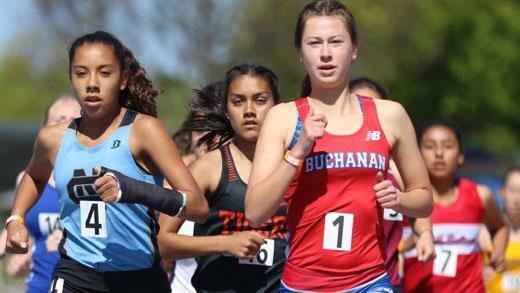 Lowe's Buchanan teammate, Corie Smith, was a double winner on the day in the 1600m (4:58.27) and the 3200m (10:39.44). Smith and Lowe look to take their success from today into next weekend's Arcadia Invitational in the famously competitive and fast 3200 meter race. The Liberty (Bakersfield) girls team enjoyed two double winners with sophomore Reese Renz winning the 100 hurdles (14.92) and 300m hurdles (44.50). Faith Bender, also 10th grader, won both the discus (150-11) and the stacked shot put (43-5.75) that had five girls top the 40-foot mark. The Central Section is known for a great tradition in the throwing events and currently boasts the state leaders in both the shot put, with Liberty (Bakersfield) senior Daniel Viveros, and the discus, with Buchanan (Clovis) senior Christian Johnson. They welcomed Southern Section star Carlos Aviles from Ventura into town for a battle between several of the top throwers in the State. Viveros didn't disappoint, winning his specialty with a heave of 65-11.50 with Johnson taking second. Then the roles were reversed in the discus, which matched four returning state finalists, when Johnson won with a throw of 181-50 while Viveros took second, Aviles third, and Buchanan (Clovis) junior Kyler Van Grouw fourth. In perhaps the surprise performance of the day, Clovis West senior Dante Chachere had the second-best long jump of the day, only a half inch behind Foster, during the seeded flight. His entry mark was only 20-9, but he stretched out to a 23-1.50 mark, good for 8th in the state. Chachere is a football and basketball star for Clovis West who doesn't seem to have participated in high school track and field until this year. Good to see that the three-sport athlete is still alive and well. 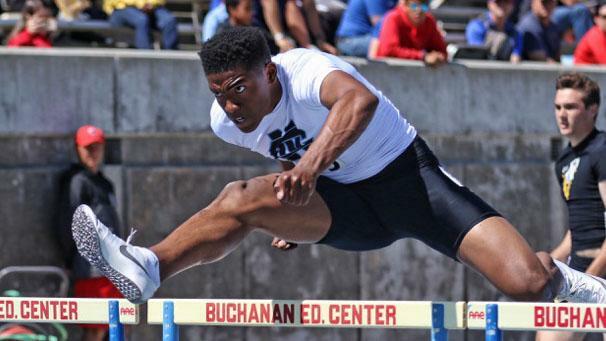 On a beautiful day with perfect weather, quality competition was alive and well at the 2019 West Coast Relays, soon to be home of a new surface for CA's best to shine on at the Gateway to Track and Field in Clovis, California.